The 2014 Native American Dollar represented the sixth annual release of the series created to celebrate the contributions of Native Americans to the development and history of the United States. In addition to the standard versions, this year’s coin was also issued with a special enhanced uncirculated finish. The theme for the reverse design was how Native American hospitality had ensured the success of the Lewis and Clark Expedition. The design carries a depiction of a Native American man offering a pipe while his wife offered provisions of fish, corn, roots, and gourds. In the background is a stylized image of William Clark’s compass highlighting “NW”, the area in which the expedition occurred. The reverse was designed by Chris Costello and engraved by Joseph Menna. 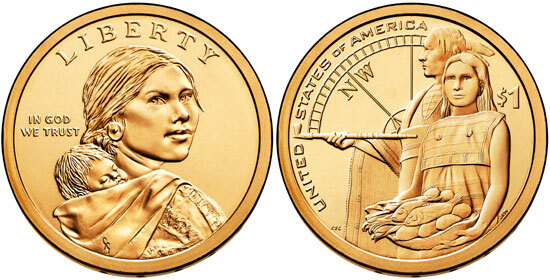 The obverse design of the coin features the image of Sacagawea and child, which was also related to the Lewis and Clark Expedition. Sacagawea was the Shoshone woman who had accompanied the expedition to serve as an interpreter and guide during the exploration of the Western United States. The obverse was designed by Glenna Goodacre and originally used for the Sacagawea Dollar series before being adopted for the Native American Dollar series from 2009 onwards. As in recent prior years, the 2014 Native American Dollars were not issued for general circulation, but only available within numismatic products sold by the United States Mint. On March 20, 2014, the Mint offered circulating quality versions of the coins struck at Philadelphia and Denver within 25-coin rolls, 100-coin bags, and 250-coin boxes. Throughout the year, uncirculated and proof versions of the coin were also incorporated into various annual sets. On November 20, 2014, the United States Mint offered the 2014 American $1 Coin and Currency Set. This product contained a 2014 Native American Dollar struck at the Denver Mint with a special enhanced uncirculated finish packaged with a 2013 $1 Federal Reserve Note. The sets were priced at $13.95 with a product limit of 50,000 units. The coins featured a combination of the standard uncirculated finish with two different levels of frosting to create unique highlights within the design. This represented only the third time that the Mint had used an enhanced uncirculated finish and the first time the finish had been used for the series. The limited mintage and special nature of the 2014 Enhanced Uncirculated Native American Dollar attracted collector attention and the sets quickly sold out.